The stormy season came late this year. Not until the 7th lunar month did the news incessantly broadcast forecasts about the first storm of the year heading in from the East Sea. Since the night before, the air had been deadly still and sweltering. Everybody prepared for the wind and rain that was about to lash down any moment. Fortunately, professor Hà ĐạiThịnh’s children had all returned in time for his funeral. Hoàng Thu Thảo leaned back on an armchair with her arms spread and resting on the arm pads. Her two hands knitted against each other across a belly which was as big as a pregnant woman’s. Her head bent down on her fat neck, her eyes closed slightly, as if she was dozing. For several days straight, she had been sitting in this posture, making no movements even if somebody came to inquire after her. She was waiting for the moment when her beloved husband would leave her forever. It was about 10pm on the 10th of lunar July when the storm was approaching with zigzag lightening, roaring thunder and pouring rain. The rain fell down in torrents, as if to separate and isolate human beings on their own lonely islands. Doctor Hà, who had warned Thảo a few days before that Thịnh’s life was slipping away, shook his head at her. “For decades working in this profession, I’ve never seen anyone so resilient. Are all of his children here? Is he still waiting for somebody else?” the doctor asked. Thảo looked at her husband then the doctor. Was it true that her husband was waiting for his adopted son? Nonsense. When she was still wondering how to answer the doctor’s question, the gate bell suddenly rang, repeatedly. The person who kept pressing the bell seemed to be afraid that the people inside were sleeping or the sounds of rain and winds were drowning out the ringing. The bell ringing made Thảo’s children and grandchildren rush out into the yard. Who was coming in this stormy weather? Thảo was racking her brain when one of her sons-in-law walked out with an umbrella to open the gate. In a few instants he returned with the adopted son. The woman stood transfixed. “How did you know?”Thảo spoke at last. Everybody looked at Bùi with wide eyes, wondering what he was talking about. Thịnh suddenly stirred and opened his eyes slightly to look at his adopted son. He craned his neck in one last move then heaved his final breath. The family howled in pain. The crying of his wife, children and grandchildren mingled with the loud raging storm which was gathering force outside. Over 60 years in marriage, Thảo had always taken good care of her husband and children. Residents in the neighbourhood considered her an ideal model of a wife and mother. As a rural girl who went to Ha Noi to study, she met and married Thịnh who was a generation older than her. He had a prestigious teaching job and a 24-sqm apartment on the third floor of the Thanh Xuân Bắc collective quarter. After her graduation, he helped her get a job working for the university lab. Thảo had hoped that marrying a college professor would give her a comfortable life. However, after they had kids, life got tough. Both of their salaries weren’t enough to accommodate their expenses. Thảo decided to quit her job to engage in trade to make a better life for her husband and children. While she ran around selling one thing or another, her husband, besides carefreely going to his lecture everyday, could only sit and reminisce about his old days of comfort when he was born with a silver spoon in his mouth into a well-known land owner family in a mountainous region. Surprised and confused by what was happening, Thảo asked her husband who Công’s father was and was told that the old man had been a Confucian scholar and fortune-teller. When her father-in-law Hà Đại Vũ was still the chief of the village, one day a fortune-teller passed by his house. The village chief invited the fortune-teller in to draw a lot for him. The fortune-teller predicted that despite his wealth and large family, the village chief would see his family torn apart and he would suffer death on the streets. The village chief instantly lost his temper and ordered his men to arrest the fortune-teller for a beating. However, he later calmed down and forgave the man. He even asked the man to stay in his house and work as a teacher for his children. That fortune-teller was Công’s father. So Thảo had a significant amount of money for her investment. The first thing she did was buy nearly 500sqm of land to build a grocery store. Just as people say, “in business, capital is more important than talent” indeed. Her store quickly yielded profits, and the more money she made, the freer she was to charge high prices. After money, she aimed for prestige because the two go together. She decided to send both her husband and two daughters abroad for further study. Everything went well except that the richer her family became, the colder their relationship with her husband’s siblings grew. Aunts Phú and Sang and uncle Vượng used to visit them every day. Her husband’s sisters and brother, who had received a classical education, had supported each other through all those difficult years. They had shared everything from a loaf of bread to a TrườngSơn medicated oil bottle. Yet, everything changed now, each family held their own death anniversaries for their parents. 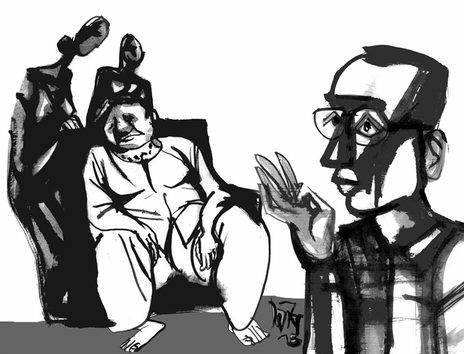 Then one day out of the blue, uncle Vượng called for a family gathering in which he and his two sisters interrogated Thịnh and his wife about the money that their father had left behind. Thảo denied everything, her husband kept his mouth shut and his head down, not daring to look into his siblings’ eyes. After that Thịnh became a different person. Every time he saw his sisters and brother, he walked the other way. His siblings didn’t want to see him either. Once when his older sister Phú fell ill, Thịnh brought a bag of gifts to visit her but her son walked out, looked at him as if he were a stranger and refused to invite him in. After that, Thịnh became depressed. Whenever he went home from work, he sat in silence staring at his ancestors’ altar, which hurt Thảo deeply. Hoàng Thu Thảo knew that besides the cold relations with his siblings, Thịnh also felt sad about not having a son to pass down his lineage. That was why she yielded to his wish and took the trouble to return to Trịnh Khúc village to offer to adopt Công’s younger son Bùi as their own. If only Bùi were a vulgar country pumpkin. Thảo would give him some money, build a house for him in his home village and that would be the end of it. However, like his paternal grandfather, Bùi loved studying and ignored material things. So just like with her precious daughters, Thảo had to fund his doctorate education. Bùi acquired a PhD in philosophy and became a college lecturer. The problem was that while Thảo and her daughters threw themselves into making and worshipping money, Bùi was indifferent and always declared, “money is irrelevant.” Thus Thảo disliked this adopted son, while the professor loved and took pride in him. Thịnh asked his wife to invest more in Bùi but she refused. Even his flesh and blood turned out to be nothing, let alone water, she thought inside. Though Thảo didn’t say so to her husband’s face, she tightened the budget and left him no chance to take care of Bùi. Yet when he fell ill, Thịnh wrote a will which left a large amount to his adopted son. He even divided the 500sqm lot into four equal parts for his wife and all of his three children. What choked Thảo up in anger was that for years living with Thịnh, she was the one who had single-handedly taken care of the family, yet he had secretly saved a considerable amount for Bùi. In his will, Thịnh asked Bùi to use the money to build a house to live in and tend to his adopted parents’ altar when they died. The will gave Thảo many sleepless nights. She would be driven insane if such a huge property fell into the adopted son’s hands. That was why despite her husband’s entreaties, she didn’t tell Bùi about his serious illness. Yet, the adopted son managed to find his way through the rain and storm to return home right at his father’s dying moment. Luckily for Thảo, no sooner did Thịnh see Bùi than he passed away, without having the time to tell his son anything about the will. Thảo and her two daughters looked at Bùi aghast. Nobody believed a word he said but it was true; Thảo couldn’t find her husband’s will. “Please go down now mum. It’s time to start the mourning ceremony,” Bùi said. Without any other option, Thảo had to forget her husband’s will for the moment in order to get through the funeral. After the funeral, the adopted son carefully arranged wreaths and tidied up professor Hà ĐạiThịnh’s tomb, respectfully burned three incense sticks and stood for a while before leaving. He didn’t ask anything about the dead man’s will or wishes. 49 days passed since professor Hà Đại Thịnh died. Though she had tried her utmost, the widow Thảo still couldn’t find her husband’s will. She worried herself sick. Every night she saw Thịnh in her dream talking about his adopted son just like when he was alive. He wanted his wife to help Bùi with him. And just like in the old days, in her dreams Thảo still controlled the budget resolutely and didn’t give her husband a chance to do what he wanted. Exactly on the 49th day after his father died, Bùi phoned his mother. He apologised for being too busy to return home to burn incense for his father’s death anniversary. Bùi asked if his mother had found the will. Again, Thảo insisted that her husband didn’t leave any will. Bùi said, “Dad did leave a will and I know what he wrote. But I was an undutiful son to him because I didn’t take care of him even for one day when he fell ill, so I don’t deserve what he left me. I turn down his offer.” At that moment, Thảo felt like choking. With much effort she asked, “Okay. So where is the will now?” Bùi sounded surprised at her question. “How would I know?” he asked. “But wherever you left it, it’s still there. You’ll find it shortly.” Thảo shouted at the phone, “You’re nuts!” Then angrily she flung away the phone as well as several phonebooks on the table. They dropped on the floor. And look, right there from an old phone book, Thịnh’s will fell out. In disbelief Thảo pounced upon her husband’s dammed will. She took it downstairs where her children and grandchildren were burning incense on his altar. Taking in a deep breath, the widow bowed down three times before her husband’s altar with the will in her hands. Then she raised the will near the candle fire. Her hands shook. As the will started to catch fire, with consternation she saw Thịnh’s eyes on the altar photo look as if they were burning too. The incense bowl burst into flames. Thảo’s mind swirled. She dropped the will and banged her head against the edge of the altar. She fainted.